On Mill Street, just off St George’s terrace in the Perth CBD, you’ll find the healthy haven, Panache Cafe. If you’re in a hurry and want a healthy, takeaway breakfast Panache is the way to go. 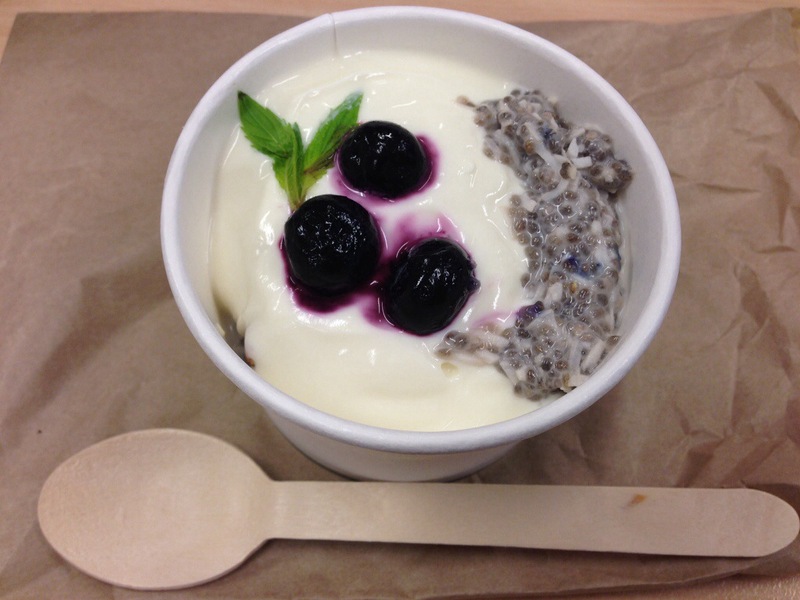 A favourite is the chia pudding with almonds, natural yogurt and blueberries. The chia doesn’t have much flavour by itself, but as a soaked pudding develops a lovely creamy texture that just needs the yogurt and the sweetness of the blueberry to set it off. A great contrast to the crunch of the almonds, and a pretty awesome breakfast, especially for $6.90! 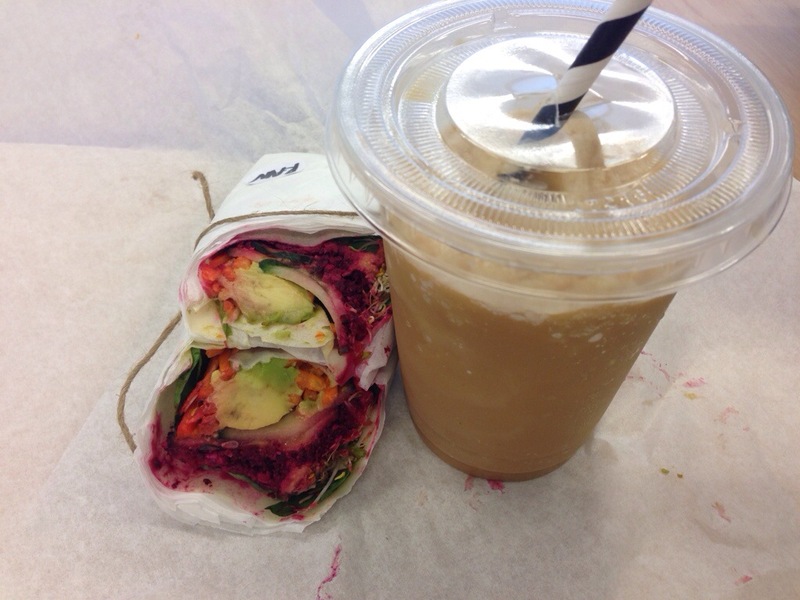 Or for lunch how about a raw coconut wrap with a healthy ice coffee. Yes that’s right a healthy ice coffee, made with almond milk, organic maca powder, espresso, vanilla bean and stevia all blended with ice. It doesn’t taste like your conventional ice coffee, but it still has that coffee hit with all that extra goodness. The raw coconut wrap is something else again. There’s something strange about eating a wrap made of coconut, and though its a bit more fragile then a normal wrap you do get used to it. The wrap was filled with creamy avocado, homemade hummus and vibrant beetroot. Plenty of flavour, completely good for you! Its a small and a bit expensive serve at $9 but for something as unique as a raw coconut wrap, I don’t think many people will mind. 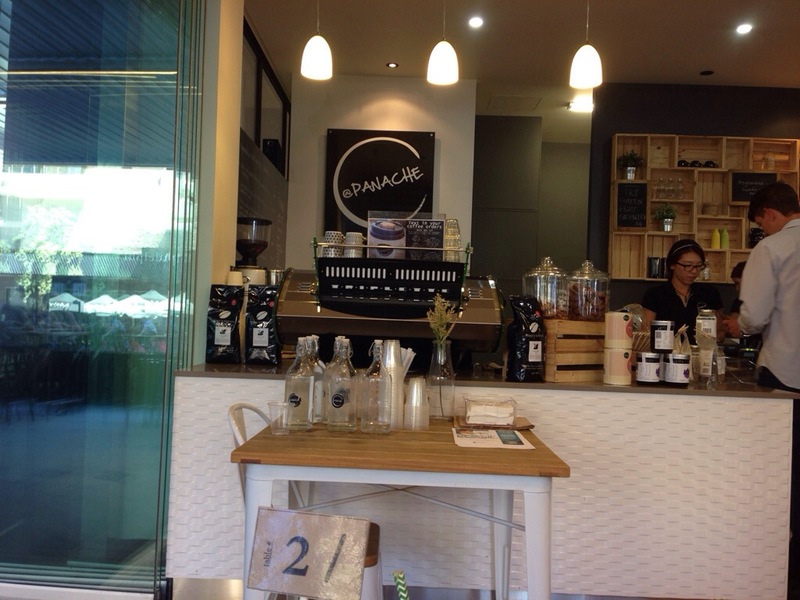 If you’re looking for healthy food and drink in CBD you truly can’t go past Panache! Note: this post was written over six months ago, I thought I had posted it but actually had not! Tut tut, bad blogger, bad. Apologies for the delay.